Ivy Circle Berlin – Brauhaus Südstern: Brewmeister guided tour, tasting and treats – The Yale Club of Germany e.V. 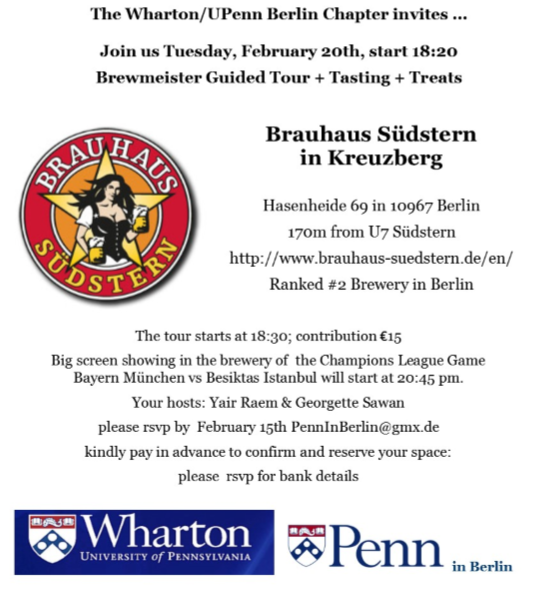 The Wharton / UPenn Berlin Chapter invites all members of the Ivy League to an evening at Brauhaus Südstern, followed by a big-screen showing of the Champions League game Bayern München vs. Besiktas Istanbul. RSVP by February 15 is required: PennInBerlin@gmx.de (€15 contribution, bank details upon rsvp). For more details, see the Facebook event.